Hot and tropical climate tempered by trade winds throughout most of the year. The driest period is from January to April and there is increased rainfall in summer and towards the end of the year. The volume of rain varies according to altitude; rain showers can occur throughout the year. The average annual rainfall is about 125cm (50in) to 200cm (80in) with a wetter season from May to October. Like the other Leeward Islands, St Kitts lies in the track of violent tropical hurricanes which are most likely to develop between August and October. Tropical lightweights, with light rainwear advisable all year round. 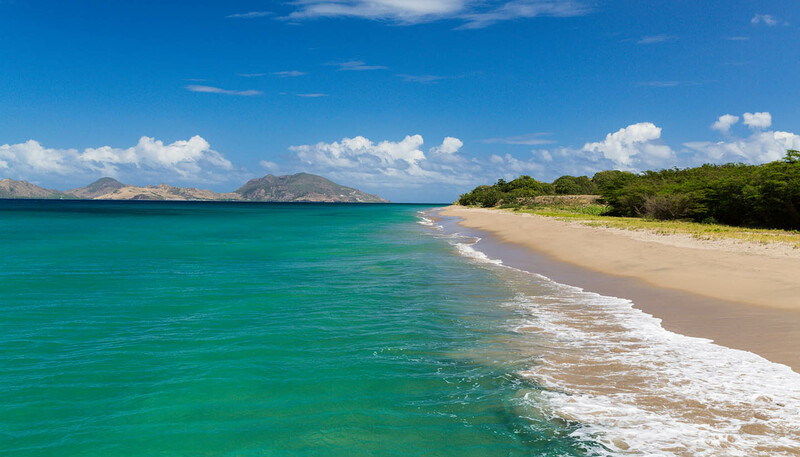 St Kitts (officially known as St Christopher) lies in the northern part of the Leeward Islands in the eastern Caribbean. The high central body of the island is made up of three groups of rugged volcanic peaks split by deep ravines. The vegetation on the central mountain range is rainforest, thinning higher up to dense bushy cover. From here, the island's volcanic crater, Mount Liamuiga, rises to almost 1,200m (4,000ft). The foothills, particularly to the north, form a gently rolling landscape of sugar-cane plantations and grassland, while uncultivated lowland slopes are covered with thick tropical woodland and exotic fruits such as papaya, mangoes, avocados, bananas and breadfruit. To the southeast of the island, a low-lying peninsula, on which there are many excellent beaches, stretches towards Nevis. Some 3km (2 miles) to the south and only minutes away by air or ferry across The Narrows channel is the smaller island of Nevis, which is almost circular in shape. The island is skirted by miles of silver-sand beaches, golden coconut groves and a calm, turquoise sea in which great brown pelicans dive for the rich harvest of fish. The central peak of the island, Nevis Peak, is 985m (3,232ft) high and its tip is usually capped with white clouds. The mountain is flanked on the north and south sides by two lesser mountains, Saddle Hill and Hurricane Hill, which once served as look-out posts for Nelson's fleet. Hurricane Hill on the north side commands a view of St Kitts and Barbuda. On the island's west side, massed rows of palm trees form a coconut forest. There are pleasant coral beaches on the island's north and west coasts.